In the land of email marketing, there are many different considerations for determining whether your email program is successful. We all know to check click-through and open rates, but what other email metrics should you be monitoring to find your groove? What Does Your Email Marketing Program Look Like? Before we dive into email metrics, here’s something to consider. 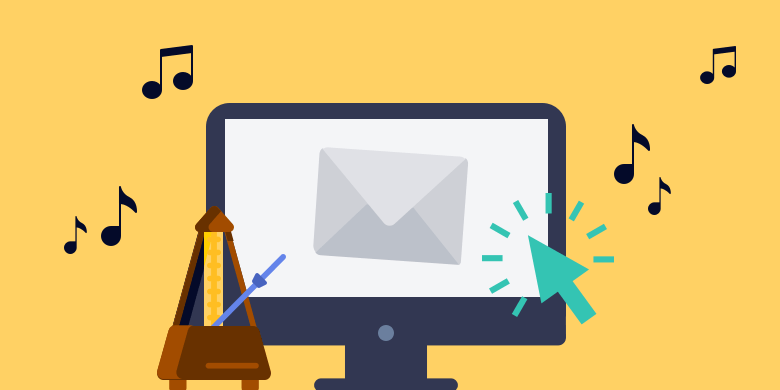 Analyzing your email program effectively depends on how you’re using email marketing to engage with your clients, prospects, or subscribers. Are you sending a monthly or weekly email that goes out on the same day or around the same time each month? Or are you sending emails “as needed”? Do you have an automated drip campaign running? Sending one-offs can be quite successful based on relevant subject matter or it could be the time of day when it’s received; it’s challenging to know which the secret to success with reactionary emails or one-offs. The real opportunity to test how your emails jive with customers is consistency. Are you sending emails once a day, every week, bi-weekly, monthly? Or is a drip campaign underway? This programming is established with a new subscriber, with emails sent consistently based upon when they subscribe. The ripple effect of subscribers receiving communications on staggered days and times may not provide the necessary optimization possibilities. The goal is to have a variety, but most importantly, at least one defined standardized cadence to establish your baseline to make strategic decisions for a rhythm that works for you. In any email marketing platform, your data that tells you how your emails performed individually and as a group. These are indicators of current successes and illustrate areas of possibilities. It’s important to look at these statistics so you know how well your emails are performing and what you can do to improve them in the future. In common email metrics, the open rate, click-through rate, bounce rate (which we keep as negligible as possible) and unsubscribes are important, but a deeper dive explores the true success of your email strategy. The click-through rate is calculated using the total number of emails on your list. Clicks per unique opens, however, looks solely at those who opened the email and how successful the click-through rate was based on this population. This is an important metric because it can tell you whether or not the email content was compelling once someone opened the email. If you had a low open rate but a high clicks per unique open rate, then it could be indicative of a weak subject line but a strong message. This is how many people reported your email as spam and why. It’s good to understand why people are reporting your emails for spam because it could indicate something is wrong with your emails, like inconsistent branding or potentially cheesy sales phrasing. If you send your emails around the same time every week or month, then you probably have a pretty good idea of your overall email success. But have you looked at when people are clicking through your email the most? Let’s say you send emails around 6 a.m. every week, but most of your click-throughs come in at 9 a.m. It might be good to consider sending your emails closer to 9 a.m. to increase your click-through rate. When in doubt, do some A/B experimentation to see achieve your best success. Unless you’re sending to an alias email that has multiple people receiving it (i.e., info@companyxyz.com), then someone who’s opening your emails multiple times could be a hot lead. This information can be especially important for B2B businesses who have extended sales cycles, and you should pass on the .csv of the list to your sales team. The best day to send email marketing communications has long been contested, but what’s clear is that it’s not the same for every industry or type of business. If you are sending emails on the same day of the week and you’re seeing diminishing results, then it might be time to adjust. It’s advisable to look at your past email sends to see which days saw better results. One of your one-off emails might have performed better than an individual email, which may indicate the content of that email or the day it was sent aided in its success. Even if you see a drop-off for one email, it’s worth testing. The bottom line to improving any email program is to test, test, and test. When the end result could be a noticeable uptick in revenue, why hesitate to A/B test? However, there are other factors that could be impacting your deliverability that need to be addressed. Your open rates and click-through rates could be impacted by an inaccurate list. This may result in lost communication with your customers. Therefore, we recommend validating and verifying your email list quarterly.